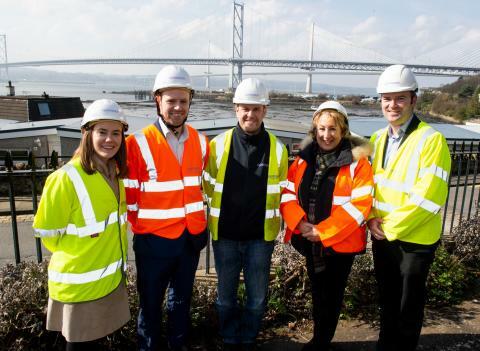 Pictured with Annabelle Ewing MSP (second from right) are the Openreach team: Vicky Macadam, James Carsley, Kris Cairns and Ben Dempster. Cowdenbeath MSP Annabelle Ewing has been shadowing Openreach engineers to see the latest developments in high-speed broadband in her constituency. She visited Inverkeithing telephone exchange and a superfast broadband street cabinet in North Queensferry and encouraged constituents to check if they can upgrade to faster services. According to the independent website Think Broadband, more than 98 per cent of premises in the Kirkcaldy and Cowdenbeath area are now able to connect to broadband at a speed of 30Mbps and above. It shows the average speeds, based on services currently purchased by local people, have risen from 3Mbps in 2010 to more than 30Mbps today – and could rise significantly if more people upgraded. The MSP also heard about the challenges and benefits of rolling out the next generation of technology – future-proof, full-fibre services capable of carrying speeds up to 1Gbps*, where the fibre connection runs directly to people’s homes. Openreach is working with several local housebuilders to install full fibre technology into housing developments in places like Inverkeithing and Rosyth. Ms Ewing said: “It’s been useful to see at first hand the progress that’s being made and hear about what’s coming next. Access to high quality digital networks helps drive our economy and I support the Scottish Government’s plans to extend access even further. “We’re fortunate to have a good level of superfast broadband locally but there is still more to do and it’s good to hear that Openreach is committed to serving Scottish communities. In addition to its own upgrades, Openreach has been working closely with the Scottish and UK Governments, local authorities and other partners since 2013 to bring fibre-based broadband to communities which were not included in any plans by commercial companies. The Digital Scotland Superfast Broadband partnership rollout has reached dozens of communities in Fife and includes small deployments of FTTP in areas where it is the best technical solution. The visit was hosted by James Carsley, Openreach’s fibre network programme director for Scotland, who said: “We know good, reliable broadband is really important to local people, and we have made great progress. However, there’s more work to be done.